Chiari malformations are structural defects in the cerebellum. That’s the part of the brain that controls balance. Some people with Chiari malformations may have no symptoms. Chiari malformations affect females more often than males. Scientists once believed that Chiari malformations occurred in only 1 in every 1,000 births. But the increased use of diagnostic imaging techniques such as CT scans and MRIs suggests that the condition may be much more common. Accurate estimates are difficult to make. That’s because some children who are born with the condition either never develop symptoms or don’t develop symptoms until they reach adolescence or adulthood. Chiari malformations (CMs) are structural defects in the cerebellum. They consist of a downward displacement of the cerebellar tonsils through the foramen magnum (the opening at the base of the skull), sometimes causing non-communicating hydrocephalus as a result of obstruction of cerebrospinal fluid (CSF) outflow. The cerebrospinal fluid outflow is caused by phase difference in outflow and influx of blood in the vasculature of the brain. The malformation is named for Austrian pathologist Hans Chiari. A type II CM is also known as an Arnold–Chiari malformation in honor of Chiari and German pathologist Julius Arnold. CMs can cause headaches, difficulty swallowing (sometimes accompanied by gagging), choking and vomiting, dizziness, nausea, neck pain, unsteady gait (problems with balance), poor hand coordination (fine motor skills), numbness and tingling of the hands and feet, and speech problems (such as hoarseness). Less often, people with Chiari malformation may experience ringing or buzzing in the ears (tinnitus), weakness, slow heart rhythm, or fast heart rhythm, curvature of the spine (scoliosis) related to spinal cord impairment, abnormal breathing, such as central sleep apnea, characterized by periods of breathing cessation during sleep, and, in severe cases, paralysis. Chiari malformations may develop when part of the skull is smaller than normal or misshapen, which forces the cerebellum to be pushed down into the foramen magnum and spinal canal. This causes pressure on the cerebellum and brain stem that may affect functions controlled by these areas and block the flow of cerebrospinal fluid (CSF) the clear liquid that surrounds and cushions the brain and spinal cord. The CSF also circulates nutrients and chemicals filtered from the blood and removes waste products from the brain. Chiari malformation type 1 is a structural abnormality of the cerebellum, the part of the brain that controls balance, and the skull. The malformation occurs when the lower part of the cerebellum extends below the foramen magnum (the large hole at the base of the skull which allows passage of the spinal cord), without involving the brainstem. Normally, only the spinal cord passes through the foramen magnum. Type 1 is the most common type of Chiari malformation and may not cause any symptoms. It is usually first noticed in adolescence or adulthood, often by accident during an examination for another condition. Symptoms, when present, may include headache, neck pain, unsteady gait, poor hand coordination, numbness and tingling of the hands and feet, dizziness, difficulty swallowing, and vision and speech problems. Depending on the symptoms present and severity, some individuals may not require treatment while others may require pain medications or surgery. Chiari malformations are usually caused by structural defects in the brain and spinal cord. These defects develop during fetal development. Due to genetic mutations or a maternal diet that lacked certain nutrients, the indented bony space at the base of the skull is abnormally small. As a result, pressure is placed on the cerebellum. This blocks the flow of the cerebrospinal fluid. That’s the fluid that surrounds and protects the brain and spinal cord. CM has several different causes. Most often it is caused by structural defects in the brain and spinal cord that occur during fetal development. This can be the result of genetic mutations or a maternal diet that lacked certain vitamins or nutrients. This is called primary or congenital Chiari malformation. It can also be caused later in life if spinal fluid is drained excessively from the lumbar or thoracic areas of the spine either due to traumatic injury, disease, or infection. This is called acquired or secondary Chiari malformation. Primary Chiari malformation is much more common than secondary Chiari malformation. Primary or congenital Chiari malformations are caused by structural defects in the brain and spinal cord that occur during fetal development. The underlying cause of the structural defects are not completely understood, but may involve genetic mutations or lack of proper vitamins or nutrients in the maternal diet. Less frequently, Chiari malformation type 1 is acquired after birth. Causes of acquired Chiari malformation type 1 involve the excessive draining of spinal fluid from the lumbar or thoracic areas of the spine as a result of injury, exposure to harmful substances, or infection. Click here to view a diagram of the spine. Chiari malformation is associated with a wide range of symptoms which vary by type. Type I Chiari malformation usually causes no symptoms. Most people with the condition don’t even know that they have it unless it is incidentally discovered during a diagnostic imaging test. Pain in the lower back of the head into the neck; it usually develops quickly and intensifies with any activity that increases pressure in the brain, such as coughing and sneezing. Some of the most common symptoms are linked to problems with the function of nerves in the brain stem. Paralysis due to pressure at the cervico-medullary junction may progress in a so-called “clockwise” fashion, affecting the right arm, then the right leg, then the left leg, and finally the left arm; or the opposite way around. The blockage of cerebrospinal fluid (CSF) flow may also cause a syrinx to form, eventually leading to syringomyelia. Central cord symptoms such as hand weakness, dissociated sensory loss, and, in severe cases, paralysis may occur. An MRI is the test most often used to diagnose Chiari malformations. If Chiari malformations cause no symptoms and do not interfere with activities of daily living, no treatment is necessary. In other cases, medications can be used to manage symptoms such as pain. Surgery is the only treatment that can correct functional defects or stop progression of damage to the central nervous system. While there is no current cure, the treatments for Chiari malformation are surgery and management of symptoms, based on the occurrence of clinical symptoms rather than the radiological findings. The presence of a syrinx is known to give specific signs and symptoms that vary from dysesthetic sensations to algothermal dissociation to spasticity and paresis. These are important indications that decompressive surgery is needed for patients with Chiari Malformation Type II. Type II patients have severe brain stem damage and rapidly diminishing neurological response. Decompressive surgery involves removing the lamina of the first and sometimes the second or third cervical vertebrae and part of the occipital bone of the skull to relieve pressure. The flow of spinal fluid may be augmented by a shunt. Since this surgery usually involves the opening of the dura mater and the expansion of the space beneath, a dural graft is usually applied to cover the expanded posterior fossa. A small number of neurological surgeons[who?] believe that detethering the spinal cord as an alternate approach relieves the compression of the brain against the skull opening (foramen magnum), obviating the need for decompression surgery and associated trauma. However, this approach is significantly less documented in the medical literature, with reports on only a handful of patients. It should be noted that the alternative spinal surgery is also not without risk. Complications of decompression surgery can arise. They include bleeding, damage to structures in the brain and spinal canal, meningitis, CSF fistulas, occipito-cervical instability and pseudomeningeocele. Rare post-operative complications include hydrocephalus and brain stem compression by retroflexion of odontoid. Also, an extended CVD created by a wide opening and big duroplasty can cause a cerebellar “slump”. This complication needs to be corrected by cranioplasty. In certain cases, irreducible compression of the brainstem occurs from in front (anteriorly or ventral) resulting in a smaller posterior fossa and associated Chiari malformation. In these cases, an anterior decompression is required. The most commonly used approach is to operate through the mouth (transoral) to remove the bone compressing the brainstem, typically the odontoid. This results in decompressing the brainstem and therefore gives more room for the cerebellum, thus decompressing the Chiari malformation. Arnold Menzes, MD, is the neurosurgeon who pioneered this approach in the 1970s at the University of Iowa. Between 1984 and 2008 (the MR imaging era), 298 patients with irreducible ventral compression of the brainstem and Chiari type 1 malformation underwent a transoral approach for ventral cervicomedullary decompression at the University of Iowa. The results have been excellent resulting in improved brainstem function and resolution of the Chiari malformation in the majority of patients. The most common surgery to treat Chiari malformation is posterior fossa decompression. It creates more space for the cerebellum and relieves pressure on the spinal cord. The surgery involves making an incision at the back of the head and removing a small portion of the bone at the bottom of the skull (craniectomy). In some cases the arched, bony roof of the spinal canal, called the lamina, may also be removed (spinal laminectomy). The surgery should help restore the normal flow of CSF, and in some cases it may be enough to relieve symptoms. Next, the surgeon may make an incision in the dura, the protective covering of the brain and spinal cord. Some surgeons perform a Doppler ultrasound test during surgery to determine if opening the dura is even necessary. If the brain and spinal cord area is still crowded, the surgeon may use a procedure called electrocautery to remove the cerebellar tonsils, allowing for more free space. These tonsils do not have a recognized function and can be removed without causing any known neurological problems. Some individuals with Chiari malformation type 1 do not have symptoms and do not require treatment. People who have mild symptoms, without syringomyelia, can typically be treated conservatively. Mild neck pain and headaches can usually be treated with pain medications, muscle relaxants, and the occasional use of a soft collar. People with more severe symptoms may need surgery. Surgery is the only treatment available to correct functional disturbances or stop the progression of damage to the central nervous system. The goals of surgical treatment are decompression of the point where the skull meets the spine (the cervicomedullary junction) and restoration of normal flow of cerebrospinal fluid in the region of the foramen magnum (the hole in the bottom of the skull where the spinal cord passes to connect to the brain). Prognosis after surgery for the condition is generally good and typically depends on the extent of neurological deficits that were present before the surgery. Most people have a reduction of symptoms and/or prolonged periods of relative stability. More than one surgery may be needed to treat the condition. Diagnosis is made through a combination of patient history, neurological examination, and medical imaging. Magnetic resonance imaging (MRI) is considered the best imaging modality for Chiari malformation since it visualizes neural tissue such as the cerebellar tonsils and spinal cord as well as bone and other soft tissues. CT and CT myelography are other options and were used prior to the advent of MRI, but they characterize syringomyelia and other neural abnormalities less well. By convention the cerebellar tonsil position is measured relative to the basion-opisthion line, using sagittal T1 MRI images or sagittal CT images. The selected cutoff distance for abnormal tonsil position is somewhat arbitrary since not everyone will be symptomatic at a certain amount of tonsil displacement, and the probability of symptoms and syrinx increases with greater displacement, however greater than 5 mm is the most frequently cited cutoff number, though some consider 3–5 mm to be “borderline,” and symptoms and syrinx may occur above that. 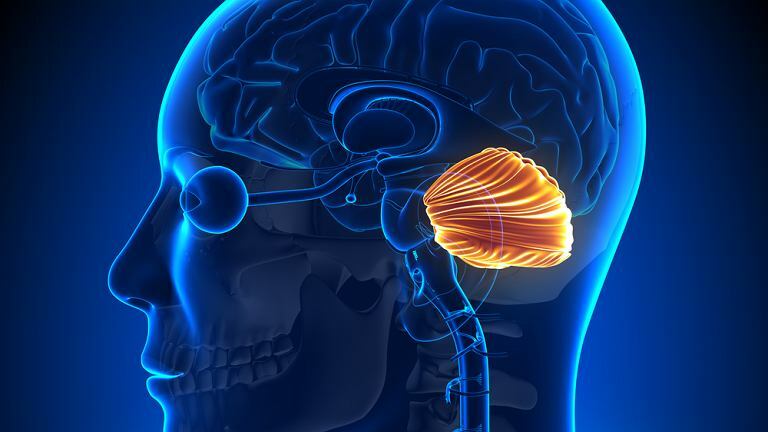 One study showed little difference in cerebellar tonsil position between standard recumbent MRI and upright MRI for patients without a history of whiplash injury. Neuroradiological investigation is used to first rule out any intracranial condition that could be responsible for tonsillar herniation. Neuroradiological diagnostics evaluate the severity of crowding of the neural structures within the posterior cranial fossa and their impact on the foramen magnum. Chiari 1.5 is a term used when both brainstem and tonsillar herniation through the foramen magnum are present. The diagnosis of a Chiari II malformation can be made prenatally through ultrasound.